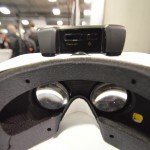 We told you that if not smart home, 2016 will be the year of virtual reality. The VR era has just started but we know it’s going to expand as more companies and developers are diving into this thing. Numerous apps and VR devices were introduced last year but they’re not enough for us to say that the virtual realm is already “there”. 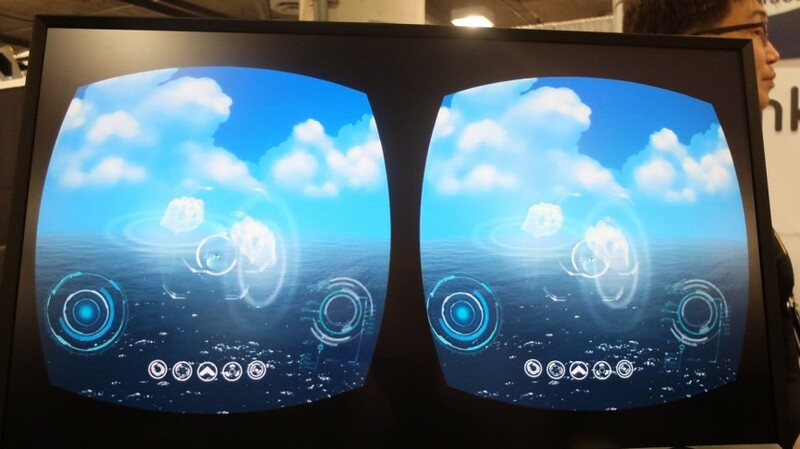 Good thing there are groups who are interested to advance virtual reality. For one, Samsung, via the Samsung Creative Lab, has given birth to a project that is expected to bring VR to the next level. If Microsoft has the Garage Project, this Samsung Creative Lab is the tech giant’s venue where employees can work on their ideas and projects. 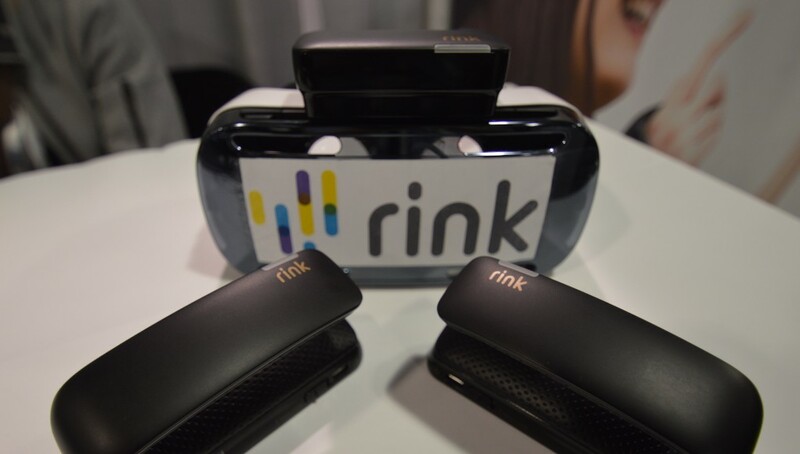 The latest project being shown off at this week’s CES is the Rink—a new pair of wireless controllers for VR headsets available in the market. This one uses magnetic field tracking and IR that connects with a special emitter box on top of a TV or computer monitor. The Samsung Gear VR is being tested to work with the Rink but any VR viewer should be supported by this controller that fits the palm. Fingers are free to move so that means you can even type on a virtual keyboard if there is a need. The Rink VR controller certainly has potential. Yongjin Cho, creator of Rink, said that its future will ultimately depend on Samsung. The company may have to see first how the public reacts to the Rink. The South Korean tech giant is one of the forerunners in the virtual reality business rolling out the Gear VR and teaming up with developers to create more games and experiences. Aside from VR headsets and apps, there is a need for VR controllers and this is where Rink comes in. Oculus already has the Rift VR headset and the Oculus Touch controllers were just introduced. The latter have yet to arrive and so Samsung has more time to catch up. As with other VR headsets and controllers, the Rink still needs a lot of refining. We’re still in the early stages of virtual reality but Samsung has an edge now with the Rink. Let’s see if and when the company will finally put interactive virtual reality on the map. Samsung's C-Lab incubator has been busy at CES 2016, showing off a health monitoring belt and Tip Talk, which lets you hear calls and audio messages by pressing your finger to your ear. 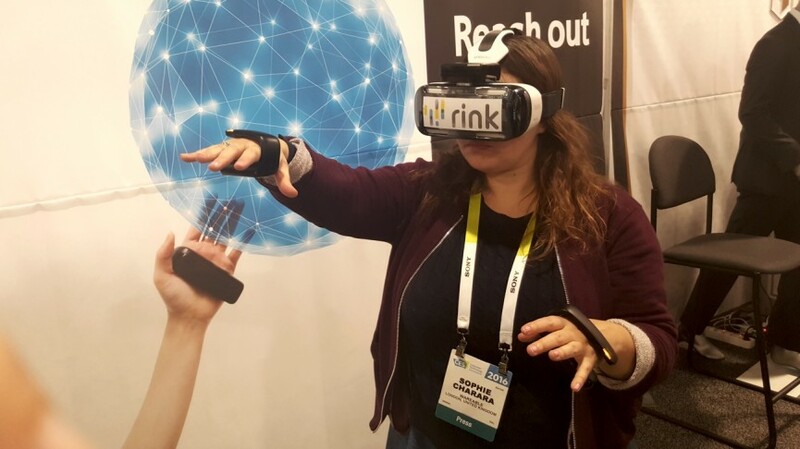 Also here under the C-Lab banner is Rink, a pair of handheld, gesture based controllers for the Samsung Gear VR. The device could be spun out into its own startup, like Tip Talk via Innomdle Lab, or developed in-house at Samsung, according to its creator, senior engineer Yongjin Cho who took a year out to create and develop the rink prototype. We say - build it, one way or the other. We're pretty sure most, if not all, Gear VR owners would buy an accessory like this. Here's how they work - you slide each hand into the middle of each wireless C-shaped controller and grip the cushioned segment. I wouldn't say it's the most comfortable on the hand right now, it's quite tight, but Rink is certainly more manageable than the HTC Vive controllers, for instance. Even the new, redesigned ones. 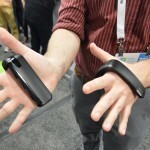 It allows you to move your hands freely rather than worry about dropping the controllers. Think of them as a fairly polished, yet simplified Oculus Touch for mobile VR. I played a fun demo where I shot at overhead planes Iron Man style by moving my hands to aim, closing my hand into a fist then quickly opening my palm out to fire energy blasts. I could see visuals of each hand on screen in the virtual scene and overall, it was quick to respond and illustrate my swipes and tilts. The demo ran well with no problems, though we've seen some reports of bugs - hey, it's a prototype. One of the rink controllers did get pretty hot by the end of my short demo, at which point we decided to call it quits. 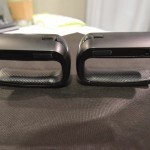 The set up requires a small unit on top of the Gear VR headset - Rink uses both infrared and a magnetic field for positional and 360 degree gesture tracking. But it's not too heavy or bulky and we're sure this isn't the final design. 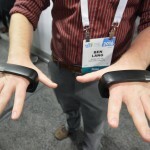 As well as the single demo the team were showing off at CES, Cho and his fellow engineers say that Rink can track individual finger gestures and allow users to interact with virtual objects. So there's clearly more to come. 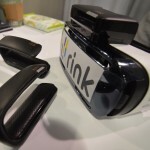 What's great about Rink is that it brings a version of high end VR controls to a $99 headset which so far relies on head tracking, a touchpad and Bluetooth gamepads. 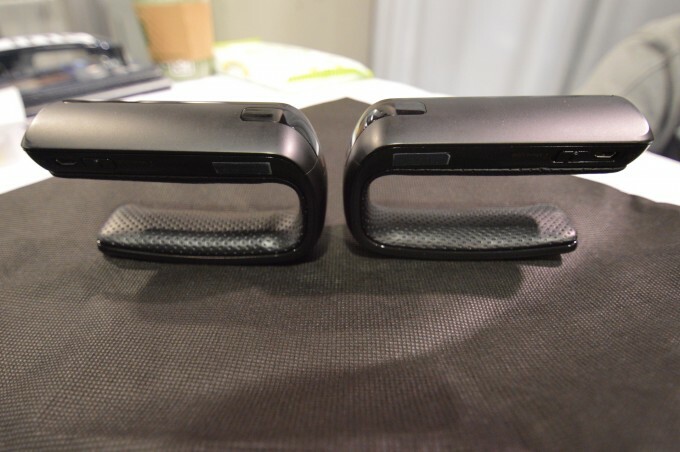 The team is referring to them as mobile VR controllers, too, opening up the possibility of compatibility with Cardboard headsets or any new Gear VR rivals we might see later in 2016. Samsung, if you're listening, Rink is a winner. We'd like a pair ASAP please. 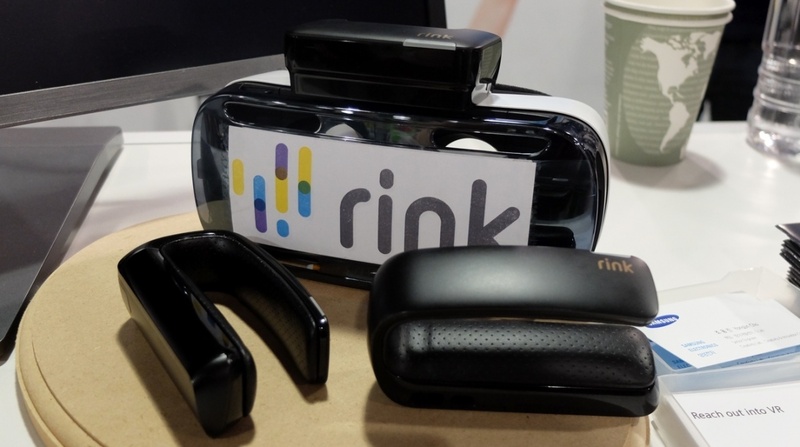 We caught up with the developers of Rink, a new wireless motion controller that uses a combination of magnetic field enabled positional tracking and infra-red finger tracking. We have a more detailed hands-on coming soon, but we thought you might take a high resolution look at the controllers, which are surprisingly well finished for prototype hardware. The rink system comprises two handheld ‘money clip’ style controllers and one basestation. 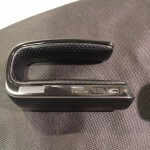 The two hand units connect via bluetooth LTE to the Gear VR, the basestation is, in essence, a dumb magnetic field generator. The handheld controllers do most of the work, using the relative strength of the magnetic field generated by the basestation to gauge position in space. In addition, the rink controller have IR LED sensors that fire towards your fingers and are able to detect the flexing of your digits. We’ll be back with our impressions later, but we’ll leave with you with these high-res shots to pore over in the mean time.